searching online is more efficient and following hyperlinks quickly puts researchers in touch with prevailing opinion, but this may accelerate consensus and narrow the range of findings and ideas built upon. I wonder if this principle holds true in multilateral disarmament? If so, it might offer insights. Anything that helps build consensus has to be good, right? But what happens when a consensus is built on a partial picture – a selective, unrepresentative view? By inference, Evans’ work suggests that we be being exposed to fewer alternatives, degrading opportunities for real discourse and shutting down potentially useful options for the future. And it may become much more difficult to change prevailing opinion after it has been established as non-mainstream views become increasingly isolated. Certainly, when an idea gets out there and spreads, it already takes a great deal to change peoples’ minds. Such concepts enter our social consciousness and belief in it is reinforced simply because so many people have heard about it. As fewer people become exposed to competing or alternative views there is a danger that the orthodoxy becomes ‘the truth’. If we’re being increasingly channelled toward a small set of ideas, and these viewpoints are self-sustaining, then how are we to set about changing things if we need to? This has certainly been a problem for the Biological Weapons Convention (BWC). The treaty underwent a significant change in direction seven years ago, when efforts to negotiate a legally binding verification instrument were set aside. This prompted some, at the time, to suggest it was a regime on the verge of collapse - an image we are still fighting despite the BWC’s stewardship process having become a different animal. The BWC now has an ongoing international process to strengthen how the treaty is implemented through national action; enhancements to its information exchange mechanisms (with growing support for more radical improvements over the next few years); increasing awareness of, and interest in, its activities by a rapidly expanding set of stakeholders; better integration into the broader disarmament and non-proliferation architecture; a plan of action for universalization that has already yielded good results in getting more states to join; and a small ‘secretariat’ to support the activities of states parties. And yet, there is still a perception that alternative structures and administrative arrangements must be created to achieve exactly the same ends. This week, as diplomats, scientists, academics and civil society participate in a BWC expert meeting in Geneva, my thoughts are certainly on what sorts of messages this meeting is sending out. I hope that given the number and range of people who are participating, there will be no shortage of opinions as to what it all means and what has been achieved. This is a guest blog by Dr. Piers Millett. Piers works for the BWC Implementation Support Unit in Geneva, Switzerland. 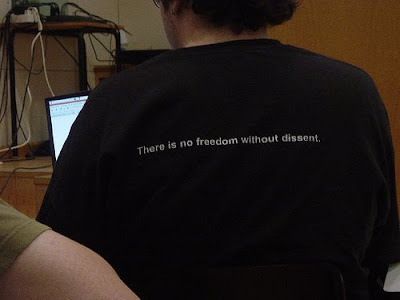 Photo Credit: "There is no freedom without dissent" by Furilo on Flickr.